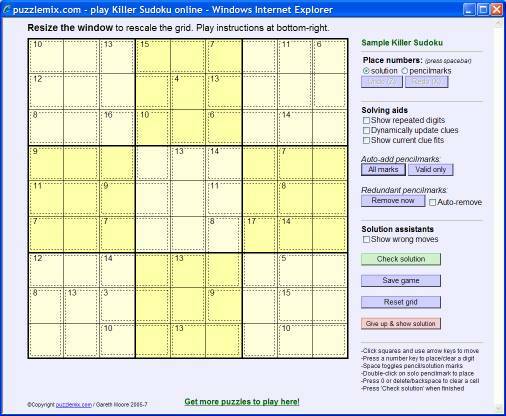 Dynamically update clues will add up the solution digits you place to solve each killer sudoku cage and then update the cage clue itself with the total remaining to be placed, coloured purple. If you place solution digits incorrectly so that they exceed the clue total, the negative difference is shown in red. When a clue is solved it is shown as a green zero. Valid only will add all valid pencilmarks based on adding all marks and then eliminating those which are already placed as a solution digit in the matching row, column, 3x3 box or killer sudoku cage. It will also eliminate those numbers which can never be used when solving the applicable cage - for example it will only leave 1-5 as valid numbers for the cage total '8'. This is often a shortcut to solving a puzzle. The pencilmark assistants that remove numbers that can never be used to solve a particular cage do so only on the basis of the original cage total - they do not pay attention to solution digits you have already placed. This is to avoid making the solving assistant too powerful and spoiling the puzzle!